Fire was contained in this corner apartment. 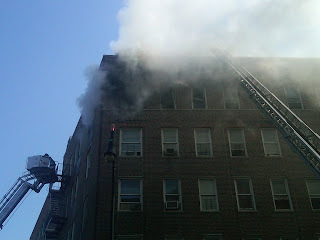 A total of 25 units and 110 firefighters descended on the building, containing the fire to the corner apartment. Battalion Chief Chris Rearer said the fire, which appeared to have started in the bedroom, was out by 10:30 a.m. He added that a separate, smaller fire broke out in the kitchen of another apartment on the other side of the building. That was contained as well, he said, and didn't cause nearly as much damage. Firefighters were forced to knock down about a dozen doors in the building and hacked through the roof to get at the main source of the fire. Damage from the fire, smoke and water used to douse the blaze will leave several individuals and families without a place to live, at least temporarily. The Red Cross was on hand to assist people with finding alternative living situations. One resident, who didn't want to give his name but said he had lived on the fifth floor for the past six years right next to the apartment destroyed by the fire, said he was sleeping when one of the teenagers living next door started banging on his door, yelling, "Fire!" He awoke and opened his door to see smoke coming from his neighbor's apartment. It filled the hallway. He threw his cell phone, wallet and ID into a bag and descended down the fire escape to safety. At some point, he said, he dropped his passport and social security card on the escape and was eager to go back inside to retrieve them. Police and fire officials were not allowing anyone back in until the carbon monoxide levels were down to acceptable levels, Rearer said. At about 12:30 p.m., residents were being allowed to enter the building and retrieve things. 3 firefighters suffered minor injuries fighting the blaze. Maria Alamo, a 70-year-old former home healthcare aide, returned to her first floor (second story) apartment, but immediately came back out, saying her eyes, lungs and throat were burning from the lingering smoke. She didn't think she would be able to sleep there tonight. The ground floor of the building is home to a few businesses, including VIP Restaurant, a Golden Crust and a bodega. Debri from the fire destroyed VIP's awning. Owner Steve Larous said water damage seeped down from the upper floors and took out all of the restaurant's electronics, including its cash and credit card machines, and covered its floor with dirty water. Soon after the fire was controlled, Larouse and his employees were cleaning up the mess. He said he expected to be open for business on Monday. Inside Golden Crust, employees and corporate officials were waiting for the water to stop filtering through its ceiling. But one official said she expected the beef patty shop to re-open tomorrow. Inside the bodega, there was no water damage, but it smelled of smoke and an employee said he felt dizzy from the fumes. Still, it remained open. Many of the residents had lived there for decades and said the building was well-maintained. This was the first time any of the dozen or so residents interviewed had ever experienced a fire. Carmen Olmo, a resident of the building for the past 22 years, was crying outside of the building as her neighbors were slowly heading back into their homes. An asthmatic, Olmo was at the St. Ann's Church flea market, which is adjacent to the building, when the fire started. When she saw the flames, she raced into her building and started banging on doors and yelling for them to get out until her asthma kicked in and forced her to escape outside. Olmo's door was one of a dozen knocked down by firefighters, but she said that wasn't the reason she was crying. "I'm crying because I'm asthmatic and this is my home and these are my neighbors," she said. Fire marshals were still investigating the cause of the fire as of this posting.